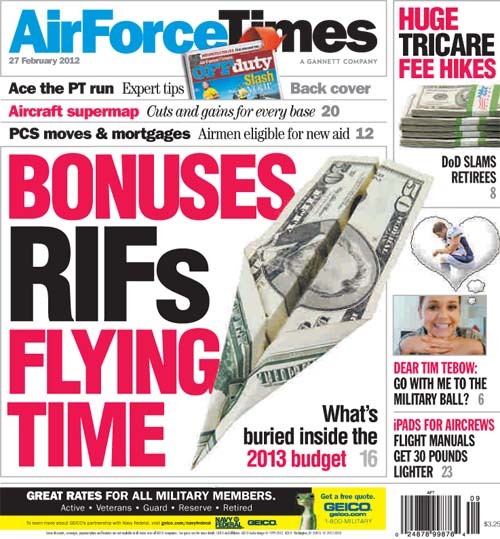 In this week’s Air Force Times, you can read about what is buried in the service’s budget for next fiscal year, which plans to cut 9,900 airmen. The Air Force has budgeted money for a reduction-in-force board to separate 388 officers, but a top service official says the Air Force isn’t planning any RIF or Selective Early Retirement Boards in fiscal 2013. Meanwhile, airmen should expect to spend more time in classrooms and less time actually flying. The proposed budget would axe $38.4 million for pilot training, translating into 24,000 fewer flying hours next fiscal year. The proposed spending cuts mean the Air Force expects to retire 227 aircraft next fiscal year. This week’s Air Force Times has a map showing which bases are losing or gaining planes. In other news, the Air Force plans to roll out a system in which airmen can email Air Force doctors and request prescription renewals. The MiCare system should be available staring June 26.